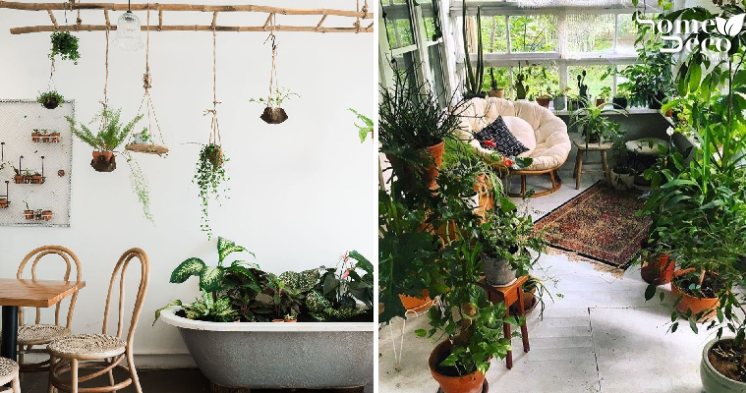 There’s no hard and fast rule when it comes to decorating your home and no one said that you can’t create your own indoor jungle right in your home. Trees, plants and lush greenery help to bring a little nature into your home to make it feel even more refreshing. Sometimes a little goes a long way and you don’t have to have huge, hulking trees in your house for an indoor jungle. Tall, leafy plants in several pots and some climbing vines work well too. If you have a green thumb then having an indoor garden is something that is right up your alley. You can create a cosy little corner and fill it with all your beloved plants surrounding you as you curl up in a corner on a comfy chair to relax. Now, we bet that you have never thought of creating an indoor jungle right in your bedroom, which is actually a really great idea. That’s because it will freshen up your bedroom while you sleep and when you wake up, your eyes can feast on lots of verdant greenery. This is an awesome way to reuse an old bathtub to make your very own lush indoor jungle with ease. You can display your plants proudly anywhere in the house as they are easily portable in the bathtub. Hang some other plants around the bathtub to make it look even more lively. Here’s another really good way to make your own indoor jungle in a jiffy. You can repurpose and old stepladder for a stylish display for your plants. Place your post on the rungs and then add a few more planters around the stepladder for a more elegant effect.